Buy Hey, That is My Fish! Links for Hey, That is My Fish! News, revies, videos and more about Hey, That is My Fish! 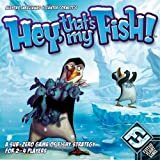 Be Gentoo with Me: A Review of Hey, That’s My Fish! Thrift Treasure: Hey! That's My Fish! Creaking Shelves Reviews Hey, That's My Fish!